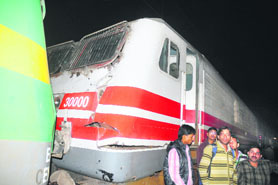 Five passengers on board the Nangal-Ambala daily passenger train sustained injuries when the stranded train was being pulled by a relief engine near the Hallo Majra railway overbridge this evening. The victims were sitting on the stairs of the bogies when they fell from the train due to a sudden jolt. What could have been passed an accident, the death of three Panchkula youths has turned out to be an apparent gory murder. On finding the bodies eaten by stray dogs along the railway track, the Government Railway Police on Sunday night had initiated inquest proceedings under Section 174 of the CrPC. However, the Panchkula police has started probing the angle of honour killing. Belying the claims of the Mohali police to have removed all illegal security tents from public places, a former Health Minister of Punjab, two IPS officers and a PPS officer are still flouting norms. Following the reports of encroachments outside the houses of bureaucrats, a team of Haryana Urban Development authority (HUDA) visited the area, following which notices were sent to the violators to clear the encroachments. The notice stated that either the violators remove the tents and other encroachments on their own within a day, or HUDA will take necessary action. “Our junior engineer went for an inspection with a team of officials, and we have also given warnings to the violators. 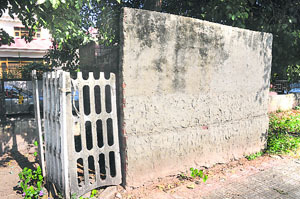 An encroachment outside the residence of an IAS officer of the Punjab cadre continues to go unchecked, with the officer justifying the encroachment and the Municipal Corporation turning a blind eye. Alertness by two UT Traffic policemen helped nab a snatcher in Industrial Area here this evening. The police arrested Ravi Shanker, a driver and a resident of Ludhiana, while he was trying to flee with Rs 12,000 that he snatched from a driver of a mini-truck after assaulting him. Chandigarh is all set to host "Destination IT@North", the eighth edition of the annual IT event, which is being jointly organised by the Chandigarh Administration, Punjab government, Confederation of Indian Industry (CII) and Software Technology Parks of India (STPI). Disappointed with the performance of family counselling centres funded by the Central Social Welfare Board, a special meeting of all six NGOs running these centres has been called by the chairman tomorrow. Chandigarh, November 20 Four months after several confidential files belonging to IAS and PCS officers went missing from the Punjab Personnel Department, the UT Police has sought legal opinion in the matter after a preliminary inquiry recommended the registration of a case. MCM College today organised “Tehzeeb-e-MCM”, a showcase of talent and creativity harboured at the college. A detailed introduction of the college and its research and academic pursuits was given on the occasion. Anurag Verma, Commissioner, Roopnagar, has directed the Mohali Deputy Commissioner, Varun Roojam, to get an FIR registered in a case of impersonation in which dead persons were shown alive by some persons in connivance with revenue officials to grab land in Kharar. Panjab University teachers are up-in-arms against the university’s decision as per which the earned leave encashment equivalent to a maximum of 10 months salary, which teachers used to get at the time of retirement, has been stopped, claiming that there is no such provision. Defying the prevailing trend of the onset of epilepsy in children, the common age of children developing the disease has come down to three years, experts at the PGI pediatrics department said. Yesterday’s emergency landing by a private helicopter carrying Kurukshetra Member of Parliament Naveen Jindal at the Chandigarh airport and subsequent cancellation of the flights has brought to the fore the problem of limited operating hours at the local airport, creating problems in the smooth operation of air traffic during emergency situations. Promod Kumar, a 30-year-old resident of Zirakpur, was thanking his stars after he escaped death narrowly last night. It was his car that split into two parts, after it was hit by a bus. At one moment he is happy that he is alive, the next moment he shudders to think what he went through. “I could see the bus moving at a very high speed and in a split of a second it hit me. For a few seconds, it seemed the world had come upside down for me,” Promod said, while recalling the Monday morning’s incident. With members of the Terminated 134 Clerk Association blocking the main road in Phase VIII this morning, hundreds of commuters had to go through a harrowing time. Long queues of vehicles were seen on the road leading to the Punjab Cricket Stadium. The proposed pilot project regarding the door-to-door garbage collection in Sector 22 has received a nod by the municipal corporation's Finance and Contract Committee. In an effort to reach out to students of impressionable ages, the Western Command is organising a series of equipment display that began at the Chandimandir Military Station today. 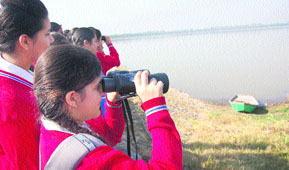 About 2,000 students from schools at Chandimandir and Rashtriya Military School, Chail (HP), witnessed the display. 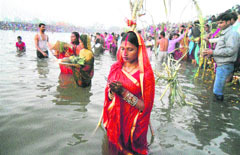 Over 1 lakh people gave offering to the rising sun on the last and fourth day of the Chhath Puja here in Chandigarh at the Sector-42 lake. 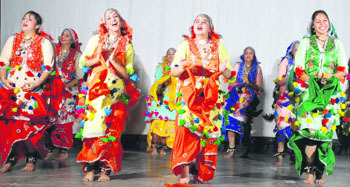 The local administration and the police had made elaborate arrangements for a hassle free festive celebration. About 150 to 200 police personnel were deputed to control the crowd. While hundreds of girl students await allocation of hostel rooms at Panjab University, the slow pace of construction work of the new girls’ hostel at the South Campus has decreased the probability of these students getting hostel rooms before the next academic session. Entrepreneurship Development Cell (EDC) of the PEC University of Technology conducted a seminar as a part of outreach activities being conducted for the annual information technology (IT) event, Destination IT, North, here today. Panchkula: Over 105 students participated in English and Hindi handwriting competition at DC Model Senior Senior Secondary School, Sector 7, on Tuesday. Senior teachers judged the entries. The school principal congratulated the winners and distributed prizes. Two persons were killed while three others, including two women, sustained serious injuries in road accidents today. 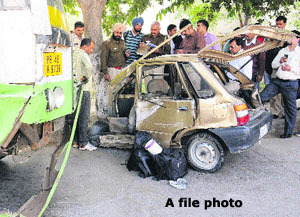 In the first accident, one person was killed while three others, including two women, were injured when the car they were travelling in collided with another car on Sirhind-Patiala Road. The cricket team of State Bank of Patiala (SBOP) was declared the runners up in the T-20 cricket tournament that was organised by the All India Public Sector Sports Board at Dehradun. The Court of Additional District and Sessions Judge Shalini S Nagpal today sentenced a former bank manager to five years rigorous imprisonment in a cheating case. The accused Karam Singh was convicted in two separate cases of cheating registered against him. He has also been imposed a fine of Rs 25,000. In December 2011, two parties contested for the rein of Municipal Corporation. In their effort to lure the local residents and youngsters many promised were made. Promises to build indoor stadiums in each ward, jobs for local sportsperson and a stadium equipped with world class sports facilities were highlighted on glittering coloured manifestos by the ruling Congress party and the BJP. 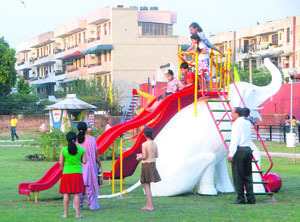 A file photo of a park at Sector 48 in Chandigarh. Top seeded Chandril Sood defeated Suresh Desai of Gujrat by 6-2, 6-2 in the ongoing CLTA-AITA Chandigarh Open Men’s and Women’s Tennis Tournament, being played at CLTA Court, here today. In the women’s category, top seeded Shweta Rana thrashed Renu Sharma by 6-0, 6-4 while in the main qualifier match of the men’s category Dhruv Goyal of Delhi beat 6th seeded Siddhesh Khade of Maharastra by 6-3 and 6-1. The kho-kho team of MDAV School, Sector 22, beat Government Model Secondary School, Sector 8, by 9 points during the ongoing 3rd Luxmi Arya Kho- Kho Championship for Boys' and Girls', today. 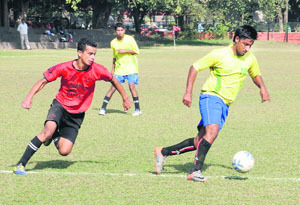 Dalbir Football Academy, Patiala, beat DFA, Ambala, in the ongoing 7th Kanwar Harbans Lal Memorial Football Tournament being conducted by the Youngsters Club while Youngsters Club played a goalless draw against Youth Football Club, Rurka Kalan, at the football stadium of Sector 17 today.